Why aren’t you taking action on your goals? What is going on today my friends? I am super excited because I am going to a Mastermind training soon with my business coach Stacy Boehman and I am going to soak up all of the amazing things she will be teaching and I will come back here and fill you all in. 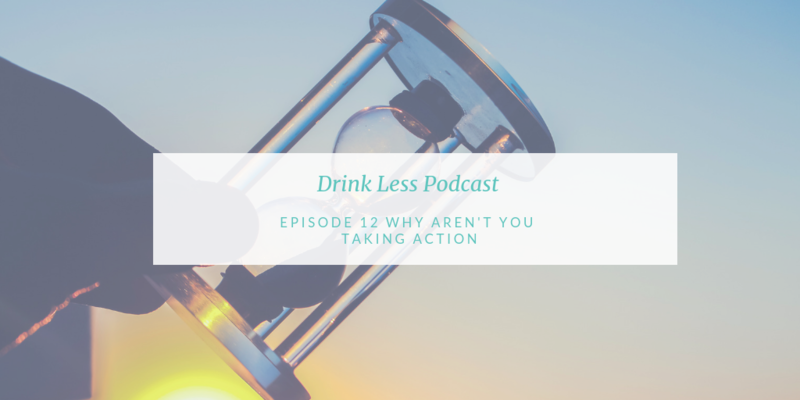 This podcast has everything to do with drinking less, and nothing at all to do with drinking less. You might be like – what? What are you talking about crazy? Getting new results in our life. And any new result comes from …. Ok say it all together with me now.. it is always about our thinking! Seriously – you guys – this is the best news ever because we are always in control of our thinking. You know, sometimes people aren’t super familiar with what coaching is and I like to say it is really just an amazing opportunity for someone else to see what is going on in your brain – from an objective standpoint, show you what you are thinking, and then you get to decide if that thinking is getting you the results in your life you want. And it really is amazing when you start doing the work to see how your life can transform. Here is the thing – so often we are over drinking as a buffer from our lives. Maybe you don’t want to feel stressed, or maybe you don’t want to deal with that family member, or maybe you just feel like you are having fun. It is all some form of escape to (you think) make you feel better. And for those of you listening trying to lose weight it’s the same idea – using food as the escape instead of wine. But we also have this desire to do more in our lives. So there is the disconnect. Maybe you feel stuck and you are not sure why. That my friends is what we are talking about today – why aren’t you taking action? It’s so interesting. I was recently listening to another podcast about weight loss and the coach was discussing the reason people aren’t sticking to their plans and not losing weight and I thought this was something that could resonate here as well. Often times the reason is because we think we are going to fail. We have been programmed to think failing is this terrible thing. If you fail, you will die..lol..
And trust me – I think I’ve mentioned this before – I used to hate the idea of failing. I’m getting used to it..lol.. as I try a bunch of new ideas as an entrepreneur I am failing – but now I consider it learning. Ok, well that didn’t work, let’s try this. In fact, it is often a combination of thinking you will fail, but maybe more accurately that you don’t believe you are a person who can accomplish that goal. So how many times have you thought something like, I can’t cut back , or – I could never have fun without the wine. Come up with the thoughts you have for any goal you are looking to accomplish. I’m always talking about our thoughts right? And the tool I use most in my practice is called The Model. It is basically a simple way to look at the Think – Feel – Act cycle. As a reminder this concept is we think a certain way, which triggers a feeling, which drives our action. So, if we are not taking action it is because of a feeling we are having. Because think about when you do take action. It is usually because you feel excited, or confident, or determined right? Now, if we are not taking action if will also be from a feeling, and I think one easy feeling everyone can relate to – is confusion. So think about your goal – if you are feeling confused thinking things like – I don’t know where to start, there is so much to learn, I need to read more or listen more and I don’t know when I could possibly fit the time in – well of course you won’t begin taking action. And I am talking about massive action. There is massive action, and passive action. The difference between passive action and massive action is everything. You may think you are taking action because you are doing things like listening to this, or reading books, or following people… consuming the information. It’s like learning – I love learning and I think learning is amazing. Learning feels pretty good right – like you take it all in and feel like you’ve accomplished something. But learning and thinking about drinking less, or losing weight, or hitting higher sales numbers alone doesn’t change your life. Action – like doing the work is what will change your life. Instead of consuming you are creating. So passive action is along the lines of learning. Massive action is continued action until you get the results you want. And massive action doesn’t always feel as great as the passive action. Now – along that path there will be obstacles. And usually it’s the obstacles that keep us from continued action. Imagine you are going to the grocery store. You have to get there for your weekly food supply – that is the goal. Now, as you drive you hit a red light. So you have to stop. You would never be like – oh my God, I’m turning around. I can’t just sit here – I’m not see any results. I’ve been driving all this way and now what? I knew I would never make it.. Lol.. But so many of us do this with our goals. We hit one obstacle and because we want immediate results we think this isn’t going to work. Instead consider it simply a traffic light. You keep going, so you can eventually get to the grocery store. You keep going, so you can accomplish your goal. There will be obstacles all along the way. That doesn’t mean turn around and go hide under the covers. You know what else you might find on your way? Might not get to the goal as you originally planned, but as long as you keep going you will. See when you are committed to a goal for yourself you may have to try a few ways to get there. The key is you honor the commitment you made to yourself and keep taking massive action until you get there. Now – let’s say you hit the obstacle – do you know what the difference will be between you quitting or continuing? Your willingness to feel what comes up in that fail. Think about it – the reason we don’t want to fail is because of how we think it feels – usually something along the lines of discouragement, shame, humiliation. But, if you are willing to feel those emotions you will notice – You will survive the feeling – it is not going to kill you…lol.. it’s funny – there is a coach in our group who says you will not die and you will not get pregnant – you can totally handle a feeling..lol..
And then you show up for yourself the next time because you know you can handle it. You always have the invitation to quit on yourself, or keep going. I want to encourage you to begin taking massive action today on your goal. I always tell you how excited I am you are listening, but I do this work so we can change the world – one amazing brain at a time – and in order for that to happen you need to be all in on doing it for yourself. For the next 30 days – if you are drinking less write down 24 hours in advance your drink plan. If you are working on losing weight – write down your food plan 24 hours in advance. Whatever your goals is – commit to 30 days of massive action. Will you miss a day? But you get to choose. The difference between you getting your results, or not, will be if you are willing to try again. And I want to bring it back to what I started with. Imagine that person you are looking to become. When you truly believe you are her you will be willing to try again. When you believe you can do it you will be willing to take massive action, fail, and try again. Knowing, you will get there. Think about how you feel believing you are her, you can do it and from that place begin taking action. I would love to hear what your goals are and it would be so much fun to see how you are all doing so please – hop on over the Facebook or Instagram – mindfulweighs coaching – remember w-e-i-g-h-s and let’s get this party started. And if you want to dive deeper into this, and see how we could work together I offer limited free consults each week – DM me on social media and we can set up a call to see if my program is a fit. Ok – That’s what I have for you today my friends. Let’s circle back same time next week. But for now – make it a great day – take care!